Muskegon – What’s a muffin without blueberries? Or a curry without chicken? Well, when blueberries are swapped for pumpkin, a muffin becomes a moist fall treat and a curry with pumpkin now has a tasty dose of beta carotene. 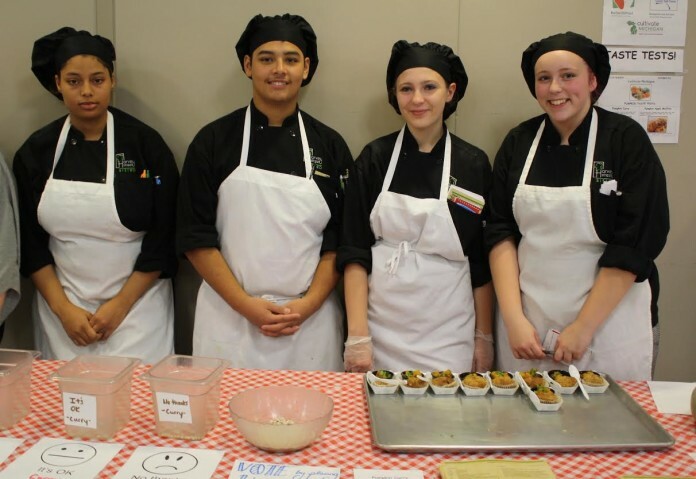 Catering and Culinary Management students from the Muskegon Area Career Tech Center (MACTC) challenged students at Montague and Whitehall Schools to think differently about pumpkin by offering samples of two new recipes to hungry students. The tastings are part of a unique partnership between Montague and Whitehall District Schools Food Services and the Cultivate Michigan program. Cultivate Michigan supporter, and Food Service Director for Montague Area Public Schools and Whitehall District Schools, Dan Gorman and Farm-to-School representative Lynn DeVlieg have been working with Catering & Culinary Management students to develop new recipes to feature at both districts. Special emphasis is placed on foods grown locally. In September, Catering & Culinary Management students visited Scholl Farms in Montague. There, owner Stu Scholl explained the differences between traditional and organic farming, and how to select a good pumpkin. Following their visit, students began experimenting with a variety of pumpkin dishes before landing on Pumpkin Apple Muffins and Pumpkin Curry. “I really want the recipe for those muffins,” shared an Ealy Elementary student returning for seconds. “I want them all!” exclaimed a Whitehall Middle School boy who had a collection of empty portion cups in front of him. Members of Montague and Whitehall’s National Honor Societies assisted MACTC students with the tasting events. Prior to the tastings, they assisted with food prep and were trained on how to provide tastings and conduct a follow-up survey. Copies of the recipes, printed by Graphic Production Technologies students at the MACTC, were provided for students and staff to take home. Visit the Student Corner at muskegoncareertech.com to download a copy of both recipes.